This review was originally published on Insatiable Booksluts on March 14, 2014. I first heard about The Ocean at the End of the Lane in Slate’s 2013 year-end book review compilation. It sounded intriguing, so I put it on my Amazon wish list and promptly forgot about it. A week or so later, my mom asked me what I wanted for Christmas, so I emailed her the link to my wish list. Happily, one of the things she got me from the list was The Ocean at the End of the Lane. I’d never read any Neil Gaiman before, so I wasn’t quite sure what to expect. It had been reviewed very well, but so have plenty of other books that I just didn’t enjoy very much. But I wasn’t disappointed in the slightest! In The Ocean at the End of the Lane, an unnamed protagonist returns to his hometown for a funeral. He drives past where his old house used to stand and ends up at the house at the end of the lane, the home of his old friend, Lettie Hempstock. He stops in to say hello, and then goes out to their back yard to sit by the pond, which Lettie had always called “the ocean.” As he sits and looks out over the water—the pond seems much smaller to him than it did when he was younger—he remembers how he came to meet Lettie when he was seven and she was eleven. What follows is a gorgeous, intricate, surreal story about the powers of friendship and love, and how they can combat even the darkest evil. I didn’t want to put it down—if I had had the time, I would have read it in a single sitting, but unfortunately, I had to sleep and go to work like a grownup. Nevertheless, I finished it in about 36 hours. Before I even finished it, I was recommending it to several friends who I knew would appreciate it. Like I said earlier, I’d never read anything by Neil Gaiman before this. But I think The Ocean at the End of the Lane puts him right up there with some of my long-time favorites, in particular because of his skill at character creation. Good characters are what really make books for me, and the characters in The Ocean at the End of the Lane were superb. I loved brash, headstrong, golden-hearted Lettie Hempstock; her wonderful mother Ginnie Hempstock; and her wise-cracking, no-nonsense grandmother, the Old Mrs. Hempstock. The narrator/protagonist was very well-drawn as well, as were his parents and sister, though they were pretty one-dimensional out of necessity, since the book was only about 175 pages long. Since the book was so short, it feels like almost anything I could tell you about the plot would be a spoiler. Suffice it to say that it is a stunningly lovely story, and it is so worth the small amount of time it’ll take you to read it. I loved this book! I listened to the audio, Neil Gaiman narrated it himself, and he does a lovely job. Great voice. You should check out Neverwhere, that was the first book I read by him, loved that one! SO GOOD, right? I did actually read Neverwhere last year, and it was okay, but I liked Ocean a lot better. I’m going to look out for this book. 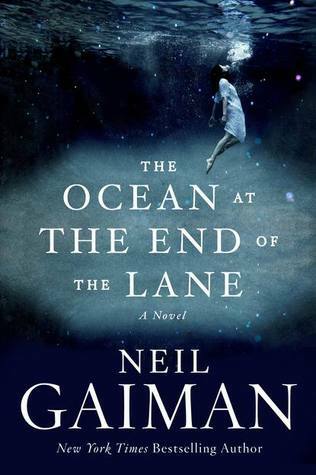 I haven’t read anything by Neil Gaiman but am excited about a book that you didn’t want to put down! I hope you love it as much as I did! I thought it was really beautiful.